Following is a selection of articles and excerpts written by others about me, my footwear or about collaborations that I have been involved in. Some of them contain inaccuracies. 2013, July 14th – Radio New Zealand, Spectrum Interview website précis and MP3 audio file of the interview. 2013, July – Sole Trader article in North and South, NZ. 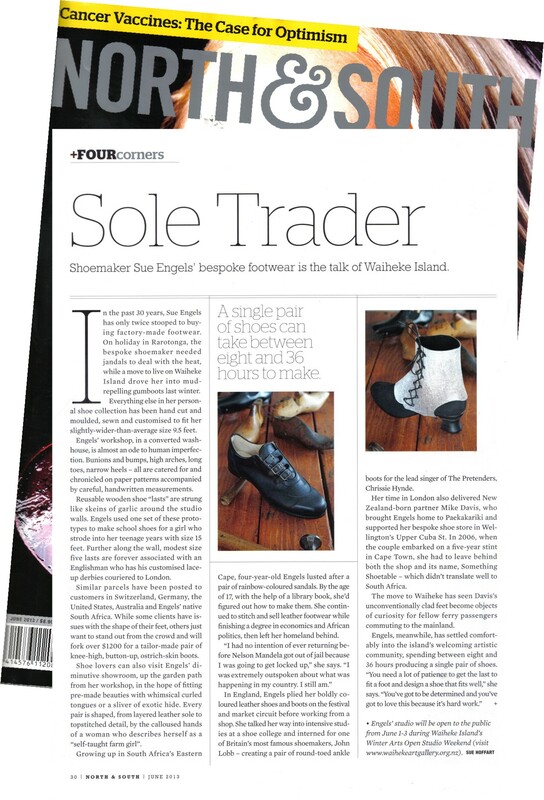 2012, June 28th – Craftsmanship with sole article in 'Waiheke Weekender', NZ. 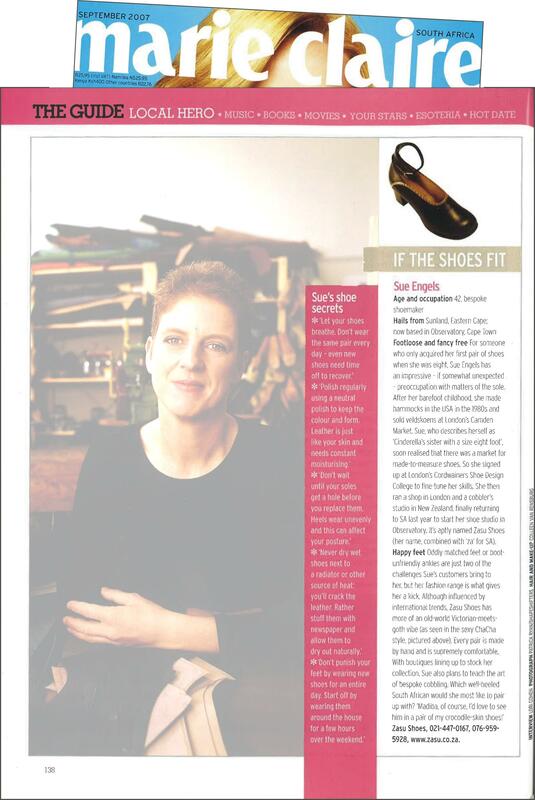 2007, Sep – If the shoes fit article in 'Marie Claire', SA. 2000, Feb – Sole searching feature in 'Grace' magazine, NZ. Disclaimer: Please contact myself and the copyright holder before repeating anything in these links, or inferring anything from them. Dear Sue . . . I left Africa in the late 80's for Montreal (by boat) with an artists co-operative. Having gained a degree in economics & a teaching diploma at the University of Cape Town - I was ready to explore the world and leave behind the prevailing atmosphere of conflict and injustice in Apartheid South Africa. Travelling the USA by bus , city to city gave me a good taste for self sufficiency and less interest in the corporate world. By 1990 I was living in London and using my knowledge gained as a self taught crafter, I began a full-time career in shoemaking, trading on various street markets. 1993/94 was devoted to studying shoe design at Cordwainers College and gaining work experience in various bespoke shoe making establishments in London. Following my studies, I ran a boutique shoe and leather goods business in Camden Lock, together with Henry Tomkins an established artisan bag maker. During this time I was very fortunate to be mentored by shoe makers, namely a last maker, a closer and a clicker, all of whom worked for John Lobb Bootmakers. With their combined guidance and support, I managed to sustain my small business and gradually built a solid clientele of bespoke footwear fanatics. 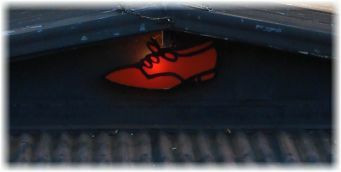 I moved to my partner's hometown, Wellington, in 1998 and set up a small bespoke business, "Something Shoetable", on Upper Cuba St. In 2006, we moved to Cape Town, South Africa, to spend quality time with my family. Here I launched the 'Zasu' brand and a bespoke shoe making studio in Observatory. By 2011 it was time for us to head back to NZ, to be closer to our family here. As a keen gardener it seemed the perfect spot to set up studio at the bottom of the garden, amongst the trees and birds. The "shoemakers shed" is just 5 minutes walk from the village, in the heart of Oneroa, Waiheke Island, Auckland. I am open to visitors by appointment most days. Just give me a call and I will be happy to take you on a quick walk in tour of my studio.